The theme song starts up, the animated foot starts tapping – another episode of My Three Sons is about to start. We've heard that music so many times over the years. 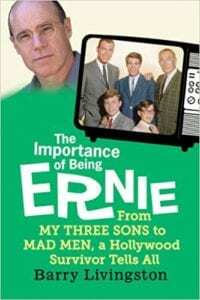 Now, one of the child stars of that iconic 60s show has written a book that “tells all,” about the show as well as gives an insider’s view of the workings of Hollywood. Like most memoirs of growing up in Hollywood, The Importance of Being Ernie begins with the early years, before stardom came calling. We meet the Livingstons, a father who never quite lived up to his parents’ ideals of success, a mother who had started her career as a fan dancer, and a couple of boisterous boys. Life was fairly typical for this family living in Hollywood, California, albeit typical for those living at the lower end of the financial spectrum. Barry Livingston, best known to millions as spunky Ernie Douglas, “the one with the big glasses,” began his acting career quite by accident. Hanging out at the local swimming pool, a reporter asked Barry, his brother Stanley and some friends to ride their tricycles across the bottom of the pool for an article he was working on. The photo caught the attention of a producer for Lassie, who needed a stunt double for Timmy. Stanley got the job and made his debut in a drowning scene. The next step on the road to stardom for Stanley was signing up with the Screen Actors Guild and little Barry was dragged along to the meeting. Learning that anybody could sign up, Barry’s mother had him sign up too – he was on his way to becoming an actor. Barry and Stanley went to dozens of auditions, where they would join other young hopefuls in a crowded room to wait, wait, wait, then be called in for an audition that might be as simple as reading one line of a commercial. After a few commercials for the boys, Stanley began getting roles in movies. Barry’s first big break came at the tender age of four when he made his movie debut in Rally ‘Round the Flag, Boys! It was also the first role from which Barry was fired – for an eye astigmatism; enter the large, horn-rimmed glasses that became part of his signature look. Barry’s mother continued to send her son out for auditions and he soon started landing small parts in other movies, commercials and eventually, as a regular on The Adventures of Ozzie and Harriet. This show in turn helped land him the role he is most known for, Ernie Douglas in My Three Sons. When My Three Sons was canceled in 1972, Barry made the decision to continue his acting career. In this book, we see the ups and downs of a child star trying to remain in front of the camera. The author is very honest about the times when job offers were few, his days of drug use, his entrance into the world of dinner theater and even his exploits with women (which are pretty tame compared to many other stars). Always respectful of the famous who are profiled in this memoir, Livingston does relate some very funny and interesting stories. We read about Paul Newman's attempt to get four-year-old Barry to focus his eyes on a television, the nice, but very reserved Fred MacMurray, the ever gruff William Frawley (Fred Mertz from I Love Lucy,) as well as many others. Perhaps the funniest story in the book deals with a poisoned pastry prop - I'm sure it wasn't funny at the time, but Livingston is able to recount the event with obvious humor these many years later. Kudos to Mr. Livingston for writing a memoir with wit, charm, and honesty - it was a lot of fun to relive those long-ago days of sitcom television with somebody who was there. Quill says: A refreshing, upbeat Hollywood memoir where we meet an actor who has overcome the odds and continues to work, five decades after beginning his career as a cute little kid with big glasses. Well worth the read!